US 'offensive' aims for Jan. interim agreement, Jerusalem internationally managed, Israeli withdrawals and 'earned' Jewishness. The Palestinian Authority (PA) negotiating team has revealed some of contents of the secretive peace talks it has been holding with Israel, under American auspices. Independent journalist Baruch Yedid, who has maintained ongoing contact with official and unofficial PA sources, described to Arutz Sheva the situation taking place behind the smoke screen. According to Yedid, talks are advancing with the goal of a framework agreement in January, well before the 9-month period set for talks. Yedid's sources reveal that the agreement includes long term Israeli withdrawals over the course of 5 to 10 years in a number of stages, including withdrawals from Judea, Samaria and the Jordan Valley. Concerning Jerusalem, Yedid reveals that discussions revolve around proposals following the model of the Vatican, whereby the Old City and the Temple Mount would be a sort of autonomous region under joint international management, including Israeli and PA representatives. The PA sources further confirm reports from last Friday stating that Kerry's aids have rented 50 rooms in a Jerusalem hotel for January from which they plan to mount a diplomatic "attack" on Prime Minister Binyamin Netanyahu and force him to accept the American plan, part of which posits an Israeli security presence in the Jordan Valley for 10 years. In addition to the 50 rooms, reports reveal the Americans have rented 2 or 3 stories in a luxury Jerusalem hotel. There, the crew reportedly will bring computerized equipment, maps and databases to aid their efforts in dictating outcomes of the talks. This January "offensive" is timed for after the Christian holidays, and is reportedly hoped by the Americans to succeed by the end of the month. Analyst Mark Langfan describes the plan as a "death-trap" for Israel. Langfan notes the plan doesn't even meet the minimum "defensible" Israeli borders as determined by the US Joint Chiefs of Staff (USJCoS) in 1967, even according to military realities of that time. 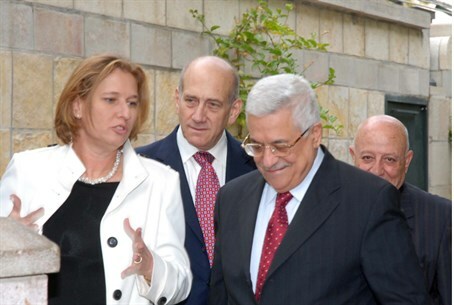 The Arab League has so far followed PA Chairman Mahmoud Abbas's lead in rejecting the plan. The PA sources claim that Abbas's official refusal to recognize Israel as the Jewish state stems from "concerns" that Israeli Arabs enjoying citizenship in Israel will be included as part of a Palestinian state. Abbas has already declared no Jews will be allowed in a future "Palestine." The proposed agreement would reportedly force Israel to obligate itself through guarantees that it will not compromise the status of Israeli Arabs, and in doing so begin "earning" PA recognition of Israel as the state of the Jews. From the PA sources, Yedid relates that there is a serious gap between reality and what is happening behind closed doors in the negotiations, which apparently have not included direct talks in weeks. Yedid further notes that the PA strategy has been to highlight how Hamas is against the planned agreement, making it easier for Prime Minister Binyamin Netanyahu and Justice Minister Tzipi Livni, who heads the Israel team in the talks, to present the agreement as an Israeli "success" and receive public approval. In an additional insight into the PA's strategy, Yedid discloses that PA leadership is against a final status agreement, reasoning that the time is not auspicious for such a deal. The US may feel obligated to compensate Israel over America's flaunting of Israeli concern in the Iran nuclear deal, and the compensation may taker the form of an agreement that is unfavorable to the PA, the leadership thinks. Therefore the PA appears to prefer an interim agreement, also reasoning that such an agreement would undermine Israel's position in the world in granting legitimacy to PA claims on Israel, and further will divide Israel from within in arguments over the deal.